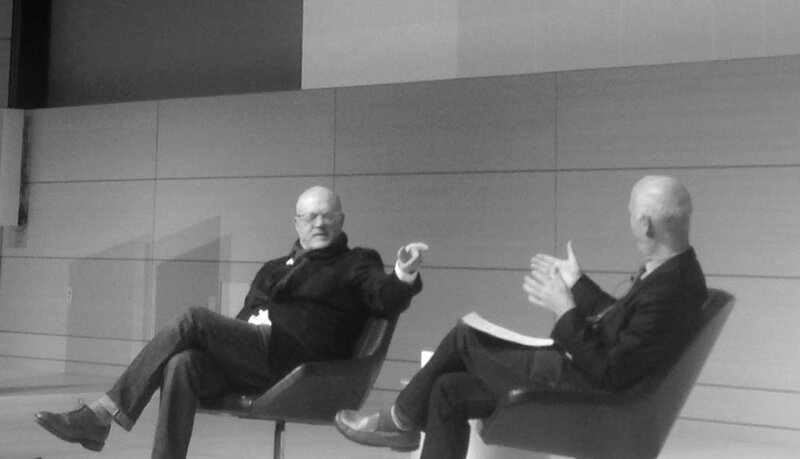 After moving downtown to their new Greenwich Village location, Parsons opened their Fifth Avenue doors for the first public lecture of the year: At the Parsons Table: Mickey Drexler in conversation with Paul Goldberger. From Ann Taylor, Gap and now chairman and CEO of J.Crew Group, Mickey Drexler talked about the business and candidly shared what he learned along the way. He told the crowd wise, intangible lessons: "You don't instantly become who you are" and "my best friend is my instinct." He spoke about how the J.Crew sensibility is not trendy, not about wearing a label, but looking good in clothes. He also showed great appreciation for his staff. Throughout the conversation he mentioned members of his team in the audience and applauded the 30 plus employees that came from Parsons. He continued to talk about how J.Crew is filled with conversations, healthy debate and welcomes questions to fuel creativity and the business. Respecting the customer is what he learned early on in his career. He told the crowd that Old Navy was named after a bar in Paris and was created because at the time, Gap jeans were at a high price point ($34.50) and the portfolio needed a value product for the customer. He mentioned several times that you "have to have respect for the customer" and gave hints that there's always opportunity to learn more, stating "most companies don't know what people are thinking" while also noting that "NYC is your classroom." As for the competition, "Everyone is competing with everyone else. And, if you don't think you are, you are not aware." "You have to have an economically viable business that sells product. It's about creating dominance in categories and count on quality." Store directors are the key to volume. The management, personal shoppers and sales teams are vital to the business and they have to shape the environment. It has to be a democratic place to shop. He talked about how brands can't spread themselves thin and must specialize in order to do the best that you can. Point blank, he stressed, "sometimes, you have to say no to focus." In-store collaborations and selling products from multiple vendors started six years ago when they learned that men didn't want to buy a uniform. J.Crew realized that there were products that people want, "but we don't have the knowledge and expertise to do it." That's when they sought out brands from around the world that would appeal to their customer. After that success, they rolled it out in their women's and children's departments. "I can go to work everyday learning."